In 1938 the company that would eventually become DC Comics launched a new anthology series, Action Comics, and picked as the lead feature Jerry Siegel and Joe Shuster’s Superman. An instant success, the Man of Steel quickly received his own solo series and was soon appearing in a nationally syndicated newspaper strip, on radio, and in various toys and other merchandise. Ultimately, Superman single-handedly launched the Golden Age of Comics, inspired scores of imitators, and raised comic books from a fledgling industry into an American art form. 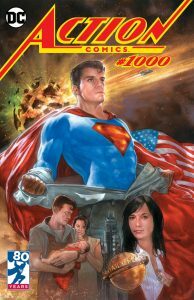 Now, eighty years later, Action Comics – the longest running DC Comics title in number of issues – celebrates its milestone one-thousandth issue with an over-sized, 80-Page Giant. Featuring an all-star lineup of top creative talent, including Jose-Luis Garcia Lopez, Marv Wolfman, Curt Swan, Brad Meltzer, Jerry Ordway, Louise Simonson, Dan Jurgens, and many more – all paying tribute to the series (and character) that started it all! Join Vault Collectibles in marking this epic milestone with our exclusive variant cover. 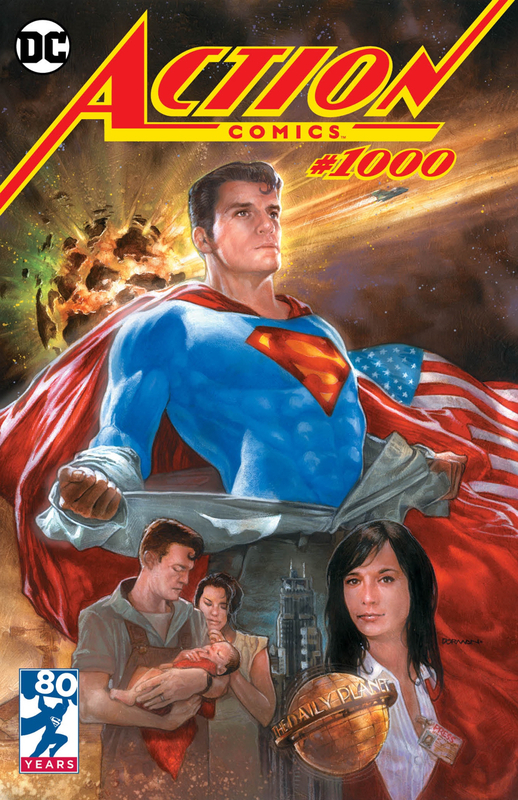 This stunning image, by comics legend Dave Dorman, is entitled “The Heroes Journey” and incorporates five major themes of the Superman mythos; the Clark Kent/Superman duality, the destruction of Krypton, Jonathan and Martha Kent raising the young Kal-El, Daily Planet reporter and “Superman’s Girl Friend,” Lois Lane, and finally the never-ending battle for truth, justice, and the American way as embodied in the America flag. Limited to only 2,500 produced! In hand and ready to ship, purchase your autographed copy here or an unsigned copy here.